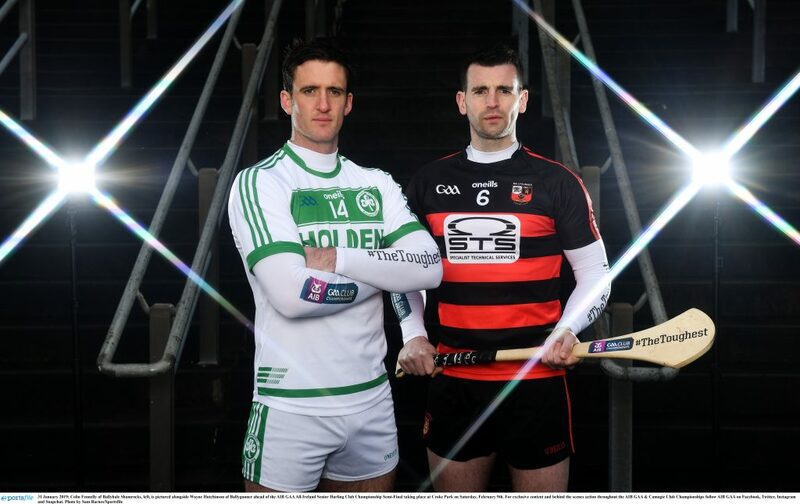 Colin Fennelly of Ballyhale Shamrocks, left, is pictured alongside Wayne Hutchinson of Ballygunner ahead of Saturday’s AIB GAA All-Ireland Senior Hurling Club Championship Semi-Final in Thurles. For exclusive content and behind the scenes action throughout the AIB GAA &amp; Camogie Club Championships follow AIB GAA on Facebook, Twitter, Instagram and Snapchat. Photo by Sam Barnes/Sportsfile. When the teams run onto the Semple Stadium turf on Saturday evening, next, one man who will know how big this is for Ballygunner, more than most, will be one of their longest serving members, Wayne Hutchinson. So was relief the greatest emotion for him after their Munster Club Final win over Na Piarsaigh? “Yeah, I suppose we’ve been trying, the last time we won it was in 2001 and we’ve been in a lot of finals since that. To eventually get over the line in Munster was a fantastic feeling because we were after being beaten in a lot of finals in the 2000s. So it was nice to get over the line, but at the end of the day it’s history and we must move on. It’s for the history books more than anything. Wayne knows the task that awaits them on Saturday, but he’s pretty sure it’s going to be a good game. “It’s going to be a great game, they are two good hurling teams, there won’t be much tactics or stuff involved, really even though, it’s Kilkenny/Waterford, the two clubs on a commutal difference there’s probably only 30 minutes between us. While their path to their fifth News & Star Cup in a row might have been fairly straight forward, their Munster trail was anything but. “Yeah, we have had a tough campaign. But to be fair, any team that has reached this level, all teams have had a tough Road. But particularly in Munster, I suppose there has been some titanic battles, not even this year but down through the last number of years. Look at the games we’ve had with the likes of Cratloe, Thurles Sarsfields, we’ve had some cracking games with them. “Then the Ballyea game this year, it was only a goal by Philip Mahony who came up from centre-back that forced extra time for us. But any of the two teams there could have won that game, it was probably the best club game of the calendar year. This is the first time since 2002 that Ballygunner have been out in championship action in the month of February, so how have Wayne and his team-mates found it? “Yeah absolutely, the last time we would have played as a club at this time of year would have been in 2002. So, it’s 17 years since we’ve been in this position, but again whatever happens, it’s a new group of players, a new management team. There’s no real identicals you can take from the 2001/02 set-up to this set-up, so for us it is completely new territory, whereas Ballyhale, they’ve been here and done it, they know how to get ready for going into these games. It has been tough, but we’ve tried to manage it to the best of our ability,” concluded Wayne Hutchinson, who will be hoping that their 2018/19 season has another six weeks or so in it.